When I bought my stinger they tried to sell me a complete 10 year warranty covering everything. I told the wife I'd keep the cost under a certain number so didn't bite. However, I am interested as I've had awful luck with cars. When my dad bought a Prius a while ago he also didn't get the warranty at purchase and about 8 months later found it online from a dealer in Michigan (we live in Oregon) for half the price!! Does anyone know of anything like that for the Stinger? The Stinger comes with a 10 year warranty already, not sure why you want to get anything else. All Kias come with a 10 year 100k mile power train warranty. A 5 year/60k mile basic warranty, 5 year/100k mile anti-perforation warranty and a 5 year/60k mile 24hr roadside assistance warranty. Are you looking to add to the basic warranty? That's not entirely correct. Audio / Nav / Entertainment / Battery is only warranted for only 3 years / 36k miles. * Dealerships make HUGE profit off of these, sometimes greater than from the sale of the car. 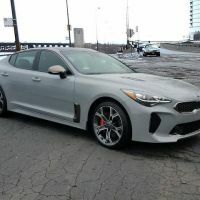 * I purchased one of these with my new Stinger from the dealer for $3,500 (seemed like a good idea, at the time), then read the fine details of exclusions, and cancelled the coverage within 10 days (I was given 30 days to cancel without suffering a fee). I received confirmation of cancellation, however, two months after purchasing, I am still waiting for the return of my $3,500! Buyer, beware of dealership greed! * If you buy online (i-search "automobile wrap policy"), a fairly comprehensive policy can be found for less than ~$2,000. Make certain it INCLUDES electronics / nav / etc. Check the exclusions carefully! * These are NOT warranties, but insurance policies, which typically have a deductible ($50, $100). They can be used at any "certified" mechanic shop, so certainly a KIA dealership should qualify. However, you must get repairs pre-approved by the underwriter before doing the repairs ... or, in an emergency, pay the mechanic up-front, and hope a reimbursement is approved after-the-fact. As I plan on owning my GT2 for ~10 years, I will be buying an extended WRAP policy (online) as soon as the dealership reimburses my $3,500. Too many electronic doo-dads & onboard computers to risk issues after the 36th month of ownership! Is this an aftermarket warranty? More details on the warranty would be great. I had heard (incorrectly) from a different dealer about the "10 yr / 100k mile" sales pitch. I contacted KIA America by email (owners.kia.com), and they informed me that KIA does NOT offer any 'extended' warranty, only that which is stated in the above referenced KIA Manual. BTW, the 10 yr / 100k mile Powertrain Warranty is for the ORIGINAL OWNER only ... subsequent owners are only offered the 5 yr / 60k mile Powertrain Warranty. Yes, I was told lots of bull from the dealership sales guy and the finance manager (which is why I initially purchased the WRAP coverage policy), but after reading the policy's exclusions realized that they would say anything to make that lucrative sale!